"Creamy chocolate-filled pastry. 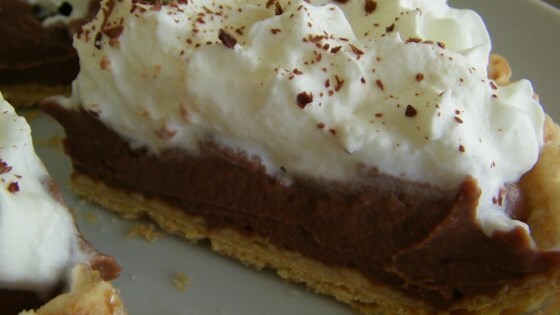 Top with whipped cream and grated chocolate if you like." Pour the hot milk mixture into the egg yolks in a slow stream, whisking constantly. Return filling mixture to the saucepan and cook over medium heat for an additional 90 seconds, stirring constantly. Remove from heat, and stir in butter and vanilla. To make and decorate this pie a day ahead of time, let pie chill as directed. Pipe gelatin-stabilized whipped cream rosettes on top of the pie; sprinkle with grated chocolate. Store in the refrigerator. I was disappointed in this pie. Mine came out too bitter, and had the taste and texture of fudge, not a cream pie. Sorry, but will not try again. This was wonderful-I served it to some friends who are chocolate lovers who declared it was the best pie they had ever eaten. I used a chocolate cookie crust and topped it with Cool Whip. Best Chocolate Pie I've had! It has been a hit with friends and family. The best part is that it is really easy to make for those "inexperienced pie makers".